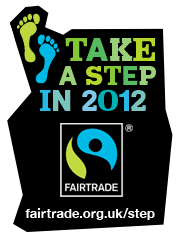 Join the Take a Step in 2012 movement to help support Fairtrade! Make your next cotton purchase a Fairtrade one! The Fairtrade Foundation’s 2012 campaign is kicked off with Fairtrade Fortnight, where the idea is simple – take a step to exchange something you usually buy for the quality Fairtrade equivalent. This could be tea, fruit, chocolate, flowers and of course cotton, the list is extensive and the small changes you make can have a huge impact on the lives of the growers and producers. Even better, encourage others to do the same, perhaps get your school or office involved! There are plenty of resources available to help spread the word, posters and wall planners to display, action packs to explore, merch to buy, you can even show your support right now by grabbing the ‘Twibbon‘ Twitter and Facebook badges to easily start the ball rolling on making a difference. There is also a guide to download on how you can support the campaign all year long with handy dates, recipes, information and ideas. In COTTON: Global Threads the section entitled Moral Fibre and much of the contemporary work reflects the historical and contemporary issues surrounding globalisation and ethics of cotton production. You can explore further the conditions cotton workers endure in the Stories of the World section of the gallery, or come along to the Unchosen Film Festival event to discover more about young people working in the cotton industry. Has the exhibition encouraged you to Take a Step in 2012? Are you more interested in where your clothes come from? Let us know!